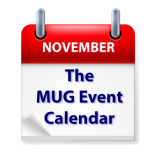 A diverse set of topics is posted on this week’s MUG Event Calendar. A California group will hear from Printrbot CEO Brook Drumm about 3D printing, while a second California group will have their second meeting on the topic. Protecting yourself from malware and adware is on the roster for a Hawaii group, and Yosemite gets the featured-topic treatment in California, Maine, Arizona and Oregon. Other topics this week include social media, Windows, iOS 8, Apple Christmas gifts, a photo service demo and Evernote.